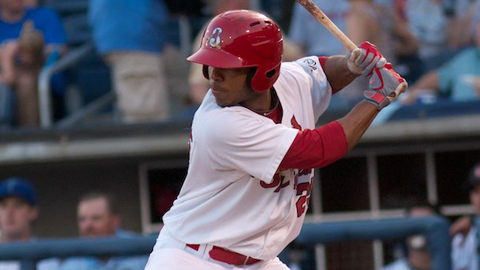 Oscar Taveras is batting .323 with 15 homers and 51 RBIs in 72 Double-A games. TULSA, Okla. -- Oscar Taveras knew when it was time to perform during the 76th annual Texas League All-Star Game Thursday night. Although he did not make it to the finals of the pregame Home Run Derby, the Springfield Cardinals' center fielder responded once the game began. He collected three hits, including a two-run homer, to lead the North to a 3-1 victory over the South before a sellout crowd of 8,047 at ONEOK Field. The Cardinals' No. 3 prospect, whose .323 batting average tops the Texas League, also ranks third in home runs with 15. His home run finished a three-run uprising in the fourth inning for the North. "I was waiting for a pitch in my zone," said Taveras, who was a unanimous choice as the game's Most Valuable Player. "[The home run pitch] was a fastball. I took advantage of it." Before Thursday night's game, Taveras -- who was signed by the St. Louis Cardinals organization as a non-drafted free agent in 2008 -- blasted two home runs in the preliminary round of the Home Run Derby. But that total was not enough for him to advance in the competition, which was eventually won by San Antonio's Nate Freiman. But he did not waste any at bats once the All-Star Game got under way. He collected the game's first hit with a lead-off single to right in the second inning, but was thrown out at second base trying to stretch the hit into a double. Then in the fourth, he slammed the first pitch he saw from Corpus Christi's Ross Seaton over the right-field fence to drive in Tulsa's Nolan Arenado and give the North a 3-0 lead. Arenado's ground-rule double had knocked in Springfield's Kolten Wong, who led off the fourth with a single and moved to second on a wild pitch by Seaton. "It was great to see Nolan get that RBI," said North manager Duane Espy, who is also Arenado's manager with the Tulsa Drillers. Arenado also had a couple of sparkling defensive plays at his third base position, including a diving stop to his right to rob Corpus Christi's Jose Martinez of a hit in the first inning. Your browser does not support iframes. "Taveras just hit a bomb," Espy said. "The funny thing is that he has some of his biggest games here [at ONEOK]. He just seems to hit well in this place." Following his home run, Taveras collected a two-out double in the sixth for his third hit of the game. He was finally retired on a grounder to second base in the eighth. Taveras, MLB.com's No. 86 prospect, had half of his team's six hits on the evening. "At the halfway point of the game, I thought that either Arenado or Taveras could have been the game MVP," Espy said. "But then Oscar kind of settled it." Eight North pitchers combined to allow the South just two hits -- a fourth-inning single by Midland's Jeremy Barfield -- and a triple by Frisco's Engel Beltre to lead off the sixth. Beltre's hit led to the South's only run. He scored on a sacrifice fly by San Antonio's Dean Anna. "There are a lot of people playing on this field tonight that we will be seeing shortly in the big leagues," Espy said. "It was great to spend time with them and see how they go about their business." Top prospects on display: The game featured several highly rated prospects, including four who are considered No. 1 prospects from their respective Major League organizations. Top prospects for the North included Arenado (Rockies) and Jean Segura from Arkansas (Angels). For the South, the top-ranked prospects were Jurickson Profar of Frisco (Rangers) and Jonathan Singleton of Corpus Christi (Astros). Duane DaPron is a contributor to MLB.com. This story was not subject to the approval of the National Association of Professional Baseball Leagues or its clubs.